A doctor proves his wife's first husband was killed by a neighbour posing as a tramp. When an intruder is killed in her house, the comfortable life of Clarissa Hailsham-Browne is turned upside-down. A lottery winner breaks up with her fiancé and marries a fortune hunter who proves to be dangerous. A chemist is working on a very important and secret new formula in a quite isolated country house. He believes someone is wanting to rob this formula and informs a friend, who is a detective. 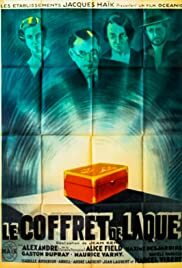 One night when several guests are in the house, the formula is stolen indeed and the chemist is about to be poisoned with a drug out of a lacquered box... Danielle Darrieux is smart and funny and René Alexandre plays properly his part. But the name of the detective is not Poirot. You'll find some suspense and a bit of espionage in this "huis-clos" adapted from A. Christie's play Black Coffee. The movie follows all the rules of the genre, but I wouldn't say the plot and the detective's deductions are really mesmerizing.